A lot going on at the moment so a small update here. The Fifteenspined Stickleback has settled in I think. In the beginning he was mostly hiding in and around the seaweed in the left hand corner and didnt pay any attention to others. Now he is smoothly cruising around even in daylight (a lot more active at night) and inspecting the seaweeds and occasionally nipping at them probably catching some small crustaceans. He is extremely intrigued by the smaller prawns and lining them up but they are too big for him. I will try to find some tiny prawns this weekend as he is not accepting any dead food. Its very nice to watch him cruise very calmly compared to the rather active three spined sticklebacks. 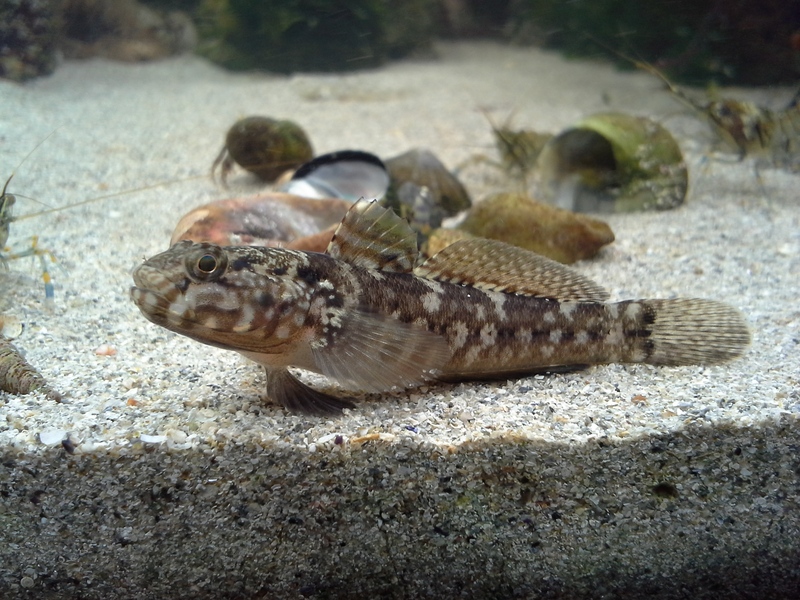 The three spined Stickles seem very happy and take any food presented. Also always inspecting seaweeds and new inhabitants. I never see them much swimming up and down the glass or any other nervous behavior so I guess they like their new home. They also seem to like the fairly high flow of the powerheads (2000lph and 4000lph). In the beginning I switched off the bigger powerhead when I fed to make sure they find enough but they actually fed a lot better when its on and are really skilled and fast in catching the food. 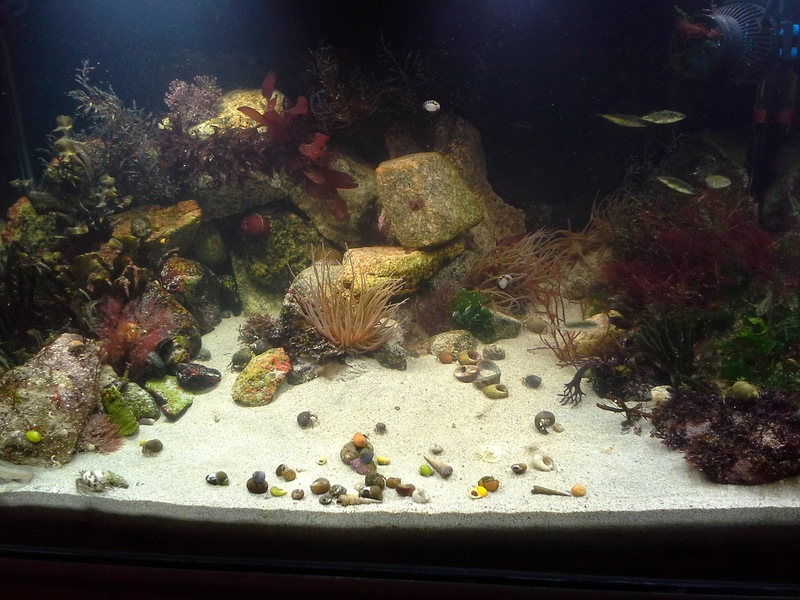 I mostly feed marine flakes and pellets but also live artemia every 4th day or so and cooked mussels for hermits, gobies and anemones. 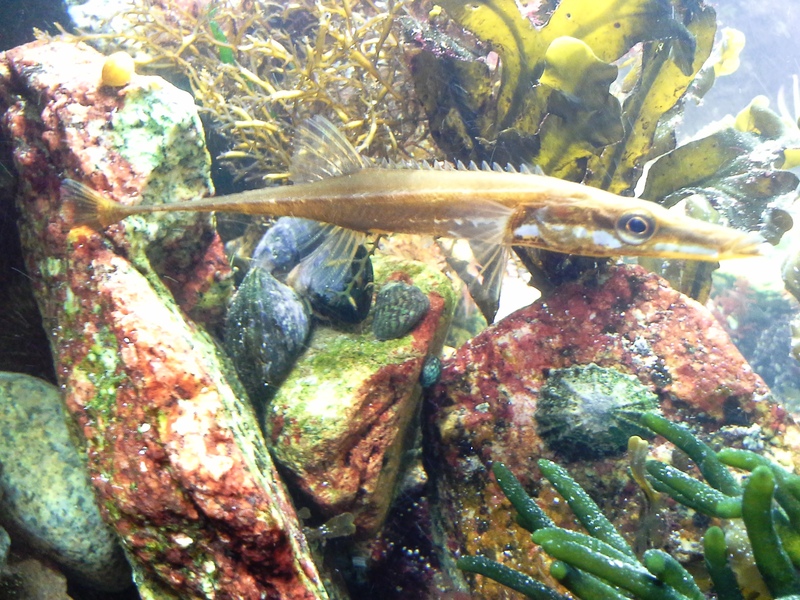 Since the arrival of the tiny Common Blenny the Rock Goby is posing a lot more near the glass when I am there and has gone darker in colour which looks great. The two brittle stars and the common star have never been seen again maybe they are under rocks or in the caves amongst them. The only stars that are around in the open are the two cushion stars. One has 6 arms which I think is a bit of a freak? None of my books show any star with an even number of arms? 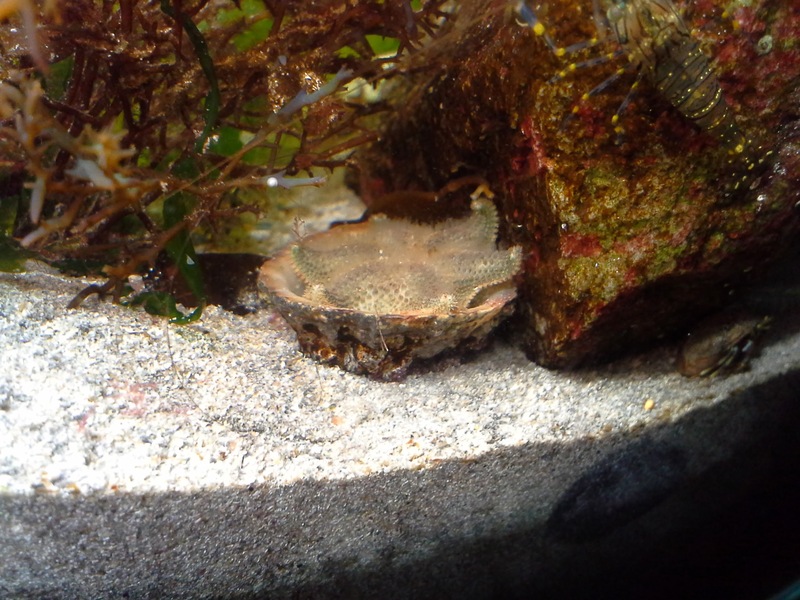 Here he is munching on a limpet. One of the bigger Lugworms is again at another sandshifting rampage and I soon will have to shift it back before my favourite rock gets covered. There is about four big ones that seem very active in shifting sand and they seem to stay in their same spots even after I shift the sand back. 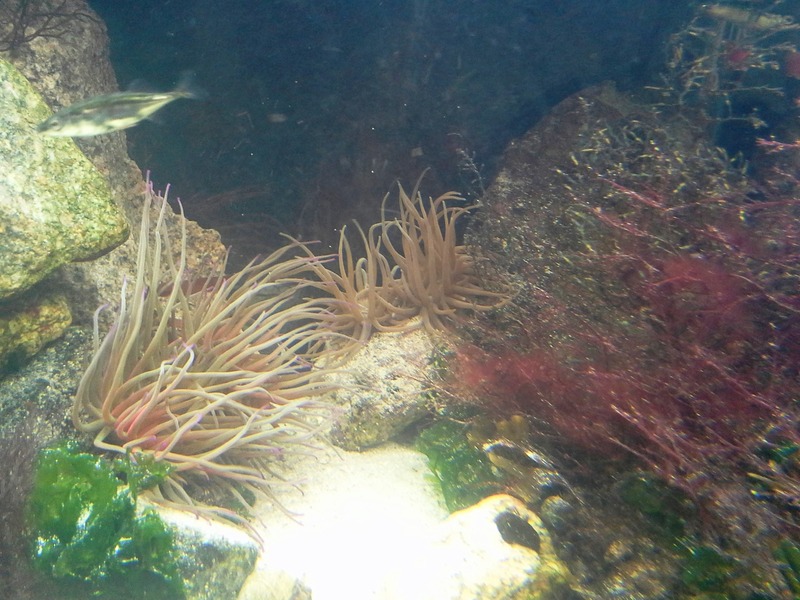 The brown snakelocks anemone has split! Was quite shocked when I saw it. Didnt expect that to happen over night. One of the red beadlet anemones was a bit bruised one day and looked as if it might have been attacked. It moved around a bit after that and the next day it was gone. I thought was attacked by the nudibranch and then eaten during that night and my hope was rising that the nudibranch its still there somewhere but later I found the anemone in the furthest other corner of the aquarium in a crevice under a pile of rocks blocking a regular hermit passage. Quite amazing how they can move so fast and far and position themselves in a strategic place without seeing anything. Quite a few seaweeds are clearly growing which is very nice and interesting. Some new ones popped out and some of the ones I placed show clear signs of growth. There is only one I can identify and its probably the easiest its Sea Lettuce (Ulva sp.). With all the others I find it very tricky to be sure. I will write a bit more about that in another post once I can identify them hopefully. A few more pictures here of life in the tank.